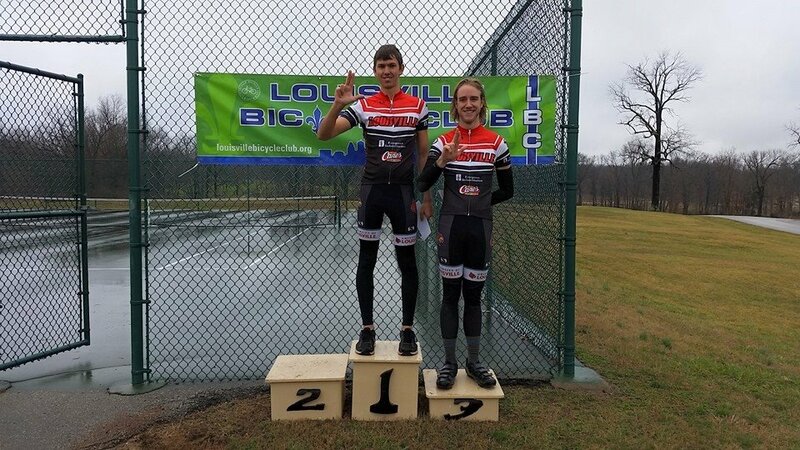 Louisville, Ky— In preparation for the collegiate season, The SCC participated in the Long Run Park Circuit Race hosted by the Louisville Bicycle Club. Rikus Van Zyl won the Cards’ first race of 2015 with a blistering sprint in the Category 5 race. The Cards also earned top ten finishes in two other events. In the rainy Category 5 race, the SCC fielded most of its Men’s D team with 9 riders total. The team controlled the entire race, chasing down every breakaway and sending riders out front. “[Abner Miralda] set me up perfectly for the final sprint,” said race winner Rikus Van Zyl. He shot around the left side of the road for the win while John Hayden took advantage of Evan Kuhl’s leadout for 3rd place. In the Category 4/5 race, Jason Eisenmenger played it safe and sat comfortably in the group. “I didn’t have any teammates, so I had to rely on other teams to keep the race under control.” He was well placed in the last lap and sprinted in for 5th place. Van Zyl takes the win! Eisenmenger joined Ben King in the Category 3/4 race, sprinting into 19th place after the podium was taken by breakaway riders. King animated the race, trying to bridge to the 2 leaders on several occasions, but fell short each time. He rode his steel bicycle with down-tube shifters into a 28th place finish. To finish the day, John Francisco, riding with no teammates, held on to a chase group of 5 riders in the Pro/1/2/3 race. The top three spots were taken by the first breakaway group but Francisco rode into a strong 8th place finish in a field replete with local professional riders. The race was a perfect learning experience for the season ahead, as the Cards prepare for the first collegiate race of 2015 at Lindsey Wilson College this coming weekend. “We couldn’t have pulled it off much better,” said John Francisco.